With a national reputation for progressive and discerning residents, Santa Monica is known as a city that cares about health. 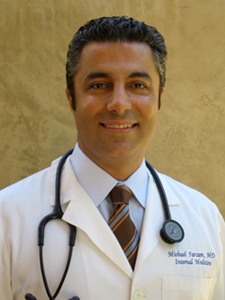 Dr. Michael Farzam of House Call Doctor Los Angeles provides the kind of outstanding urgent care Santa Monica residents and visitors expect, but with an important difference. Dr. Farzam is here to bring back the longstanding tradition of outstanding house call physicians that was once the standard. Patients and medical observers agree that he is doing an outstanding job. There are many reasons individuals might want to take advantage of Dr. Farzam's approach to outstanding urgent care in Santa Monica and all of Greater Los Angeles. First of all, being sick is stressful enough without having to spend time sitting in congested Westside traffic, only to have to then sit in a waiting room next to other ill people. The 24/7 at home concierge doctor approach employed by Dr. Farzam is perfect for the savvy and health conscious people of Santa Monica. With Dr. Farzam and House Call Doctor Los Angeles, urgent care in Santa Monica or anywhere else is something you can receive in the comfort of your home or hotel room. If you're a busy person who's been putting off looking after a chronic or lingering health issue, Dr. Farzam is happy to come to your office and many other locations. His approach to 24 hour urgent care is focused on the needs and convenience of the patients, and that's the way we think it ought to be. To find out more about Dr. Farzam's approach to 24/7 urgent care in Santa Monica, including a schedule of prices, please call 310-849-7991 today or visit our contact page.